Compare Shipping Rates Among UPS, FedEx,DHL, USPS-Post Office and More! we are here to solve your shipping problems. Let us show you our excellent service! A1 Livescan Notary Shipping is Authorized Fedex Locations for fed ex dropoff. Need to ship packages A1 Livescan Notary Shipping can help you for International Shipping, Overseas Shipping,Ground Shipping, usps shipping also we sell shipping boxes. 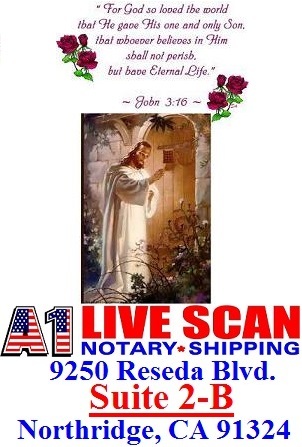 A1 Livescan Notary Shipping has been providing shipping services to the Northridge, CA community for over 24 years. We provide friendly, professional, and confidential courier services at reasonable rates. Our shipping services include FedEx, USPS, DHL, and UPS. A1 Livescan Notary Shipping is located south of Plummer, next to EMLE’S. Call A1 Livescan Notary Shipping at 818-349-4600 today.